The Australian musician, Duncan Ritchie, will be best known to our readers from his other dark ambient project Flowers For Bodysnatchers. While he started creating dark ambient initially as The Rosenshoul, he had several highly acclaimed albums as Flowers For Bodysnatchers before he was brought into the Cryo Chamber family. Aside from Atrium Carceri, Flowers for Bodysnatchers has become one of the most successful and recognizable artists on Cryo Chamber, that is, if we are to gauge success by album sales and Facebook followers. The Rosenshoul has been on hold since the 2014 release of Hidden Field. With all the output coming from the Flowers for Bodysnatchers project, I was a bit surprised to see this new album by The Rosenshoul show up on Bandcamp. Surprised, but also delighted. The difference between the two projects can often be quite minuscule. The most noticeable difference between the two project can be seen in track lengths. 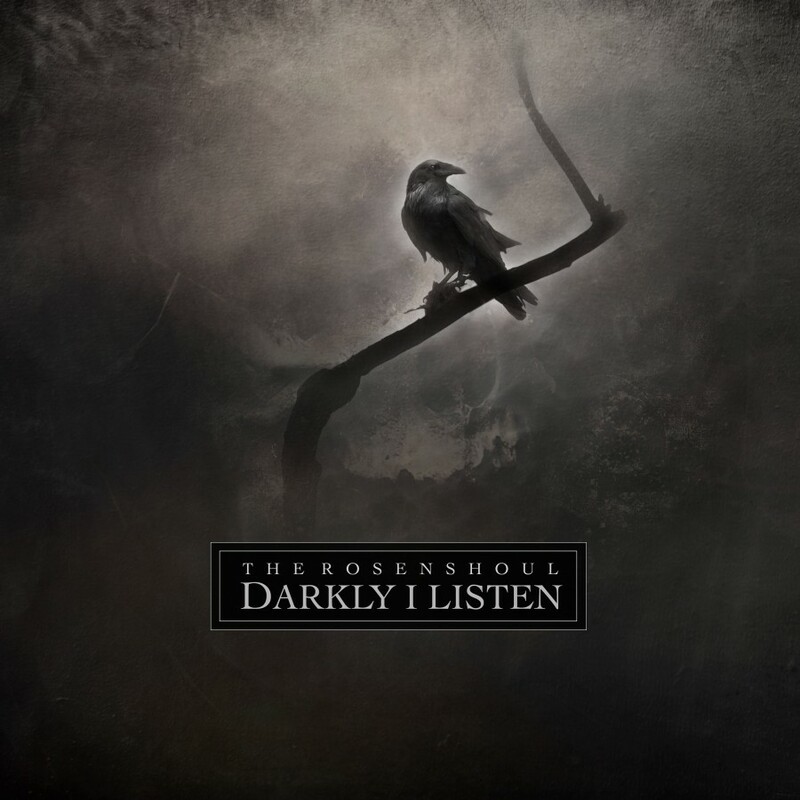 While Flowers for Bodysnatchers tracks usually run between four and seven minutes length, The Rosenshoul always delivers long-form tracks. Often as long as twenty minutes in length and usually roughly three tracks per album. This long-form style of dark ambient makes for a more intimate and uniform approach to the music. The Rosenshoul tracks have a chance to slowly develop and they can often gently slide from one emotion or energy level to another within the same track. Flowers For Bodysnatchers takes on a cinematic dark ambient style which incorporates the cinema into the tracks, building a story within itself. The Rosenshoul also has a cinematic approach, but it is less in the active sense; it leans more toward providing the role of a soundtrack. There is no shortage of field recordings, and there are stories being told, but these stories are much more subtle, allowing the listener to take a more imaginative approach to their interpretation. Darkly I Listen is full of energy, emotion and intrigue. The album comes with a companion poem, which is helpful in conveying a full understanding of the material to the listener. through the walls and the windows. show you the hell you brought unto me. The only other descriptor we are given to understand the album is this sentence: “Darkly I Listen explores a Victorian era tale of murder and otherworldly revenge.” There is no point in me attempting to tell my personal interpretations of these tracks or how they fit together as a whole. The process should be personal to each listener, and Ritchie has clearly intended for that process to be an integral part of the experience listeners have with his album. From a technical standpoint the music is a bit more musical than many other dark ambient artists, though this can also be said about Flowers For Bodysnatchers. Flowers for Bodysnatchers most often incorporates piano sections as the direct musical addition to the soundscapes. The musical elements of The Rosenshoul, specifically on this new album, seem to come in the form of string instruments. In all honesty, I’m not sure if these sections are synthesizer created or if they are the actual instruments being played, but my guess would lean more toward the former. The drone-work is quite active, with swiftly evolving drones coming in and out of the soundscapes, changing note and pattern frequently. The real foundation of this album lies in the field recordings. They have a constant presence throughout the album. They are best described as industrial, not the genre, but as in field recordings collected in an industrial district of a city. A picture comes to mind of a scene from Eraserhead, Henry (Jack Nance) wandering through a dark, rainy, gloomy atmosphere in the heart of the industrial district of some nondescript metropolis. This image fits nicely with the descriptor for the album, which describes this as taking place during the Victorian era, which was also centered amidst the industrial revolution of western civilization.